My heart is free and light--I like yours better than mine! It's harder than you might think to come up with words for an image! I like the challenge though. That is sooo cute heheh! Thanks for stopping by, stevebethere! I like your word, 'fantabulosa.' Haven't heard that before, but I'll have to remember it! Oh how cute - it makes me happy that spring & summer are coming! I'm so happy spring and summer are coming too! It can't be soon enough for me! I'm not a winter person! Thanks for your comment! Where ever we go, we take our hearts with us. How clever! I love it! It's so fun to hear what everyone comes up with! I love how everyone comes up with something different. Great job, Ann! Thanks for visiting my blog! Spring is here! I'm so excited! Oh, me too! Spring and summer are my favorite seasons. Now I can finally defrost from winter! That's sweet - airmail Valentine delivery. Cute! Airmail Valentine delivery--so perfect! Thanks for visiting my blog. I love visiting yours--we used to live about an hour away from Reno, in Herlong. (we were stationed at Sierra Army Depot) Love that part of the country! Love it, Linda! Have you read the other comments? So many different interpretations of one picture. I'm impressed with everyone's creativity! And yours is perfect! Thanks! I love the little birds, they're so happy looking. Now why didn't I think of that? Love is in the air fits the picture to perfection! Thank you for visiting my blog! Nice to meet you! Thank you! I'm such a sucker for 'cute' images like this! Thanks for your comment! 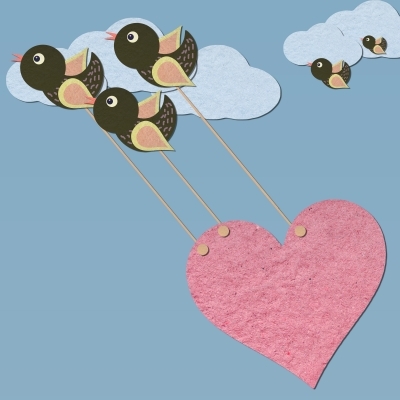 How love can soar! This is adorable! That's wonderful! No one has said that as of yet! I'm amazed at all of the different answers I'm receiving! Thanks for visiting my blog, Julie!